"Dancing with someone is an act of trust. Elegant and intimate; you're close enough to kiss, close enough to feel your partner's heartbeat. 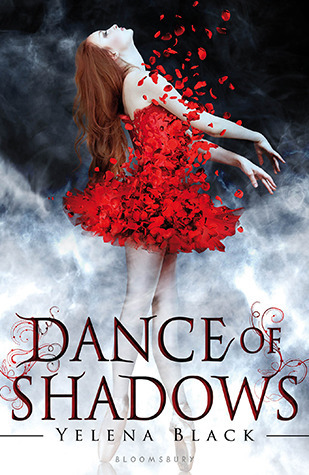 But for Vanessa, dance is deadly – and she must be very careful who she trusts . . .
Vanessa Adler attends an elite ballet school – the same one her older sister, Margaret, attended before she disappeared. Vanessa feels she can never live up to her sister's shining reputation. But Vanessa, with her glorious red hair and fair skin, has a kind of power when she dances – she loses herself in the music, breathes different air, and the world around her turns to flames . . . This definitely isn't the typical type of book I go for. Its contemporary and about dancing, yet this had something that attracted me to it and I'm thrilled I took a chance on it. The cover is STUNNING. You know exactly what the book is based around, with the added touches of sinister'ness and possible paranormal happenings. I can't express enough love it!! Before starting the book I read a little interview with the author Yelena. She mentioned a love of all things Bronte And Austen, so yet again it was a major hook for me - I am a fan of all things Bronte and Austen too. She put an emphasis of Jane Eyre, which is my absolute favourite - this was just getting better and better for me as a reader. From the beginning you have this building mystery that gets you hooked right in. I finished the first chapter with an actual Ooooh, excited to see where the story was going to go. I adored the school setting. I loved that this was a different type of school to what I'm used to reading about, be it a school for wizards, vampires, secret agents. This was a refreshing and interesting change. Yet with the mystery kept me wanting to know more. I'd heard that ballet was particularly brutal on dancers, both mentally and physically. This book shows that and then some. I really don't envy the things that dancers feet have to go through. This did suffer with something that so much YA suffers from and that is very premature declarations of love. It is in most teen set books but I still find it very frustrating. Each page turn had me suspecting all variety of things and yet I didn't guess completely correct so that was a huge bonus. I was pleased to see the incorporation of elements that I love from other books. Being cryptic to avoid spoilers is tricky sometimes. On finishing this instalment of the book I have to say I felt it had more of an Austen feel than the Jane Eyre / Bronte links that were mentioned early on. I'm really excited by the conclusion of this story and am so eager to see where the next part will go. I can actually say I have no idea how it will pan out and that is truly thrilling for us readers. This story will definitely give any wannabe dancers out there pause for thought - the world of dance just got seriously scary!! !